I’m replacing flaps all the time. Can I make them last longer? Depending on the placement of a pet door and what kind of pets use it, flap replacements can be a frequent nuisance for flap door owners. Besides the obvious solution – invest in a door that doesn’t use flaps – there are some things that can make them last longer. Keep the flap clean. 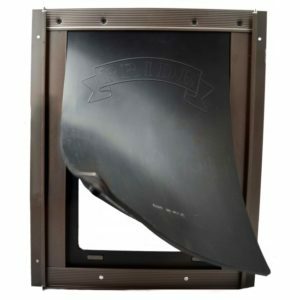 “Nose art” may not seem like a threat to a pet door flap, but if it builds up, the sun shining on the door will heat that area more than the rest of the flap. That means, that are will expand and contract more with weather than the rest, and this can warp a flap so it doesn’t close tight anymore. If the flap rips along the top edge over and over again, there are two probable solutions. Either the door is installed too low, or it’s too small for your pet. Measure your pet and the door – the top of the opening should be a couple of inches taller than the back of your tallest dog. The problem may also be that one of your dogs chew the flaps. You can try offering better entertainment, increase exercise, and increase training, but this is a behavior that can be difficult to break. Call us at 800-749-9609 and ask about chew proof pet doors. We have them.